Like many of us in the cyber world, I’m enjoying the heck out of Pinterest. I’ve read about it in a couple of magazines lately and it’s clearly become a very popular site. Here’s the thing, though, about Pinterest: it makes me want to make all the things. 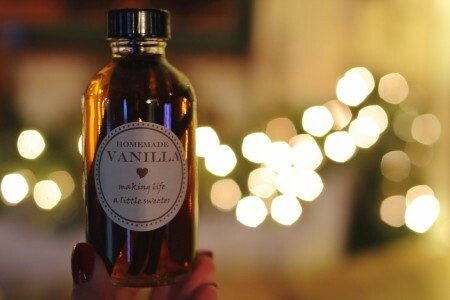 Most times, this is a good thing and I’ve had great success making homemade vanilla, pinwheels, paper garlands and more. Last Friday, though, I had failure of epic proportions. Let me explain. I saw this chalkboard serving tray and immediately decided I wanted to make one. A few weeks ago I got myself a cheap frame at Michael’s and I bought some chalkboard paint in a bottle. After I bought that paint, though, I read that chalkboard paint is also available in a spray can and that’s what is recommended for creating a chalkboard from a piece of glass. I had to go back to Michael’s to get supplies for the Super Bowl cookies anyway and while I was there I found the right kind of paint in a can. Last Friday afternoon I decided to try this project. It was a beautiful day and I figured it was a good opportunity to do this project outside. I started in the kitchen, though. I got out the frame and took it apart. I sanded the piece of glass with a piece of fine grade sandpaper. I read the directions on the paint can and then tried to remove the plastic cap. It wouldn’t come off. I saw a diagram on the top of the cap and the words underneath said, “insert screwdriver and rotate.” It did not specify whether to rotate the can or the screwdriver so I tried both. The cap still would not come off. I got a bigger screw driver and tried again. Can you see where this is going? The bigger screw driver went right through the opening in that cap and it hit the spray nozzle and knocked it off. And black chalkboard paint started spraying wildly around my kitchen. I will pause for a moment while I let you contemplate those words. I reacted as quickly as I could and threw the can in the sink but it’s hard to do anything but scream when chalkboard paint is being sprayed about your kitchen. And of course once it was in the sink it just started spinning crazily around and turning my white porcelain sink completely black. By the time I got a zip lock bag out of the drawer the can was just about spent but I shoved it in there and surveyed the mess. My hands, including my diamond solitaire and wedding ring, were covered in black chalkboard paint. There was paint on the side of the refrigerator, the side of one cabinet, the Keurig, the K cups, the kitchen counter and of course there was the mess in the sink. I started working frantically but damn that stuff dries quickly. I scrubbed and scrubbed. 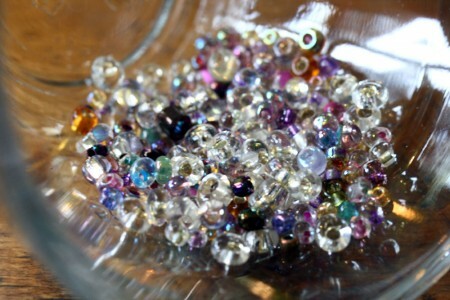 I threw my rings in the jar of jewelry cleaner. I got out bleach and scouring pads. I took a quick break and googled “how to remove chalkboard paint” but there wasn’t much of anything on accidentally spraying your kitchen with this crap so I went back to scrubbing. An hour later I looked up from my work and decided the sink was passable. The porcelain gave up the paint relatively easily except for where there are tiny scratches in the surface. 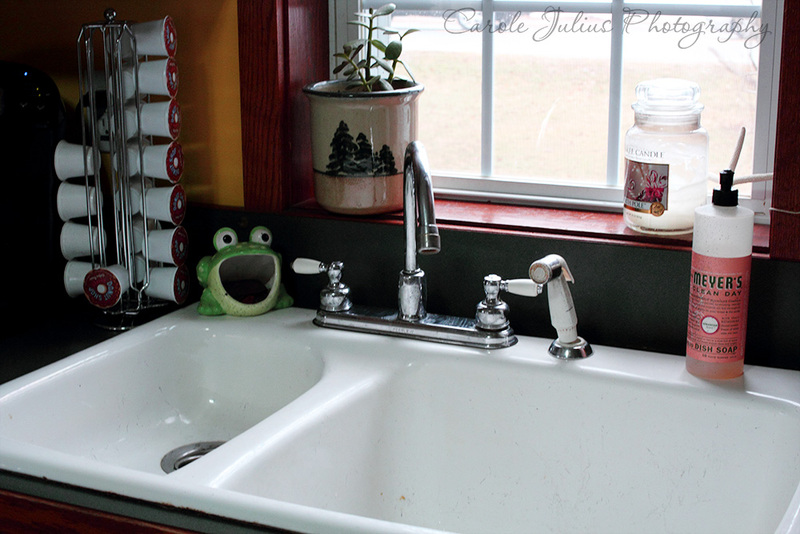 This sink is 15 years old so I’m sure you can imagine that there are lots and lots of those scratches. I couldn’t see them before but now that they are filled with black paint they are more, errrr, noticeable. It’s almost a week later and the sink is looking slightly better each day. Dale spent some quality time working on it with turpentine and a rag and that helped a lot. The side of the cabinet and fridge still have little black drops of paint on them that just won’t budge. The counter is mostly better but I removed the finish in a couple of spots with my desperate scrubbing. My rings are fine and it’s worn off my hands but it’s still under my nails in some spots. Oy. I guess I’ll just keep putting my cheese on a regular serving tray. Honestly, some of those ideas on Pinterest are probably best left alone. You remember the homemade vanilla that I made a few weeks ago, right? The time has come to start distributing this deliciousness and I want to show you the labels that I made for it. I got round printable labels at Michael’s and then went on the company website to download a template for them. I played around a bit with the font and color and finally settled on a design I liked. I had to actually tape the strip of labels to a sheet of 8 1/2 X 11 paper in order to get it to feed correctly through my printer but once I figured that out it went very quickly. I am very happy with how they look and I had fun taking a few glamour shots of the bottles. 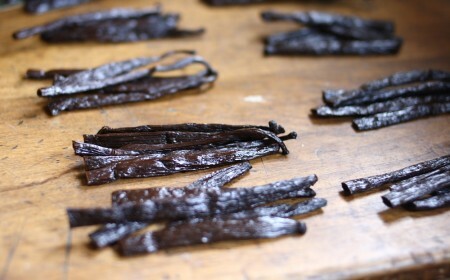 Now I can’t wait to try the vanilla! 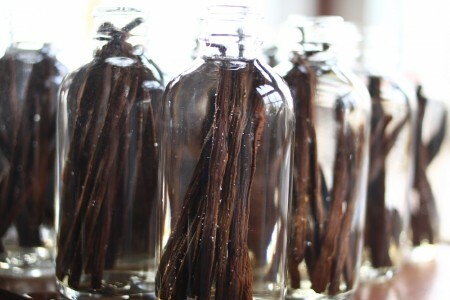 A few weeks ago on Pinterest I started seeing lots of pins for homemade vanilla. I immediately decided this was something I wanted to do for Christmas. I got right on the stick and I ordered vanilla beans from Beanilla (I chose the madagascar ones) and bottles from Specialty Bottles. And then I sort of forgot to get the vodka. 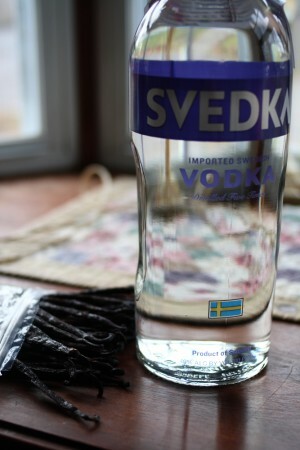 And I kept forgetting to get the vodka. 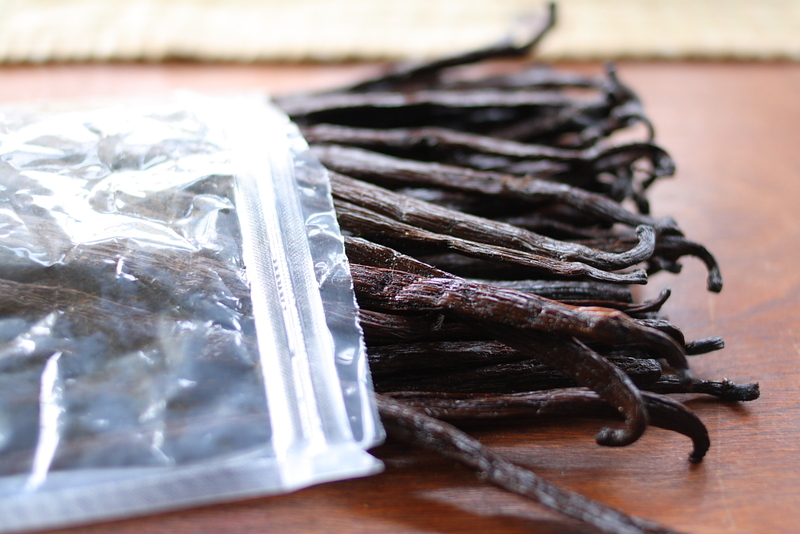 The other day, though, I finally remembered and I made the vanilla the next morning. It couldn’t have been simpler, especially since I followed these directions. I started by cutting each vanilla bean in half and then cutting each half into a V-shape. 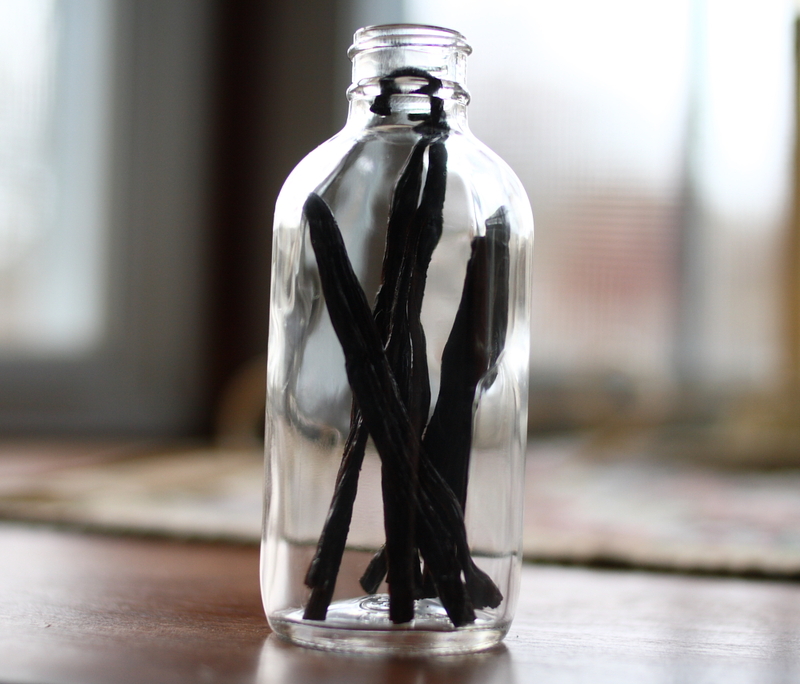 I laid all those little vanilla bundles out on my kitchen table and inhaled. Man, did that smell good. I put 5 vanilla bean halves into each bottle. 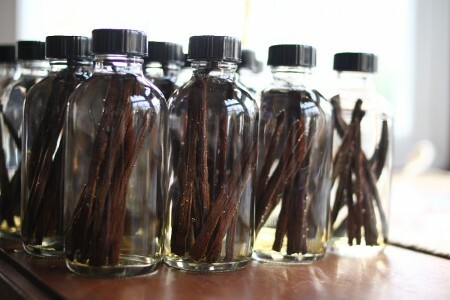 And then I filled the bottles with vodka. They need to be stored in a cool dark place for 6 weeks and they will grow up to be vanilla. Of course, these are Christmas gifts and Christmas is in less than 4 weeks, but whateverrrr. My friends will understand. And if they don’t then NO VANILLA FOR YOU! (said in my best Soup Nazi voice). There were a couple of things that inspired me to start sewing and quilting again. One was my trip to Keepsake Quilting. Seeing all the fabric and beautiful quilts definitely motivated me. The other thing, though, was making ribbon streamers for Dale’s birthday party earlier this summer. 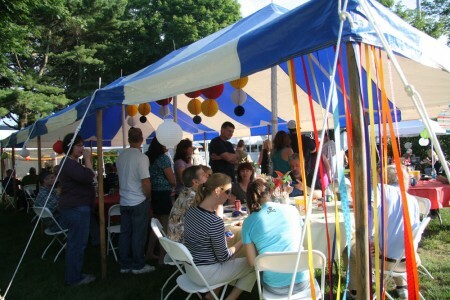 You may recall that we had a carnival theme for this party and I really wanted the tent to explode with color. We had brightly colored table cloths and candy, giant tissue paper globes and more, all in an attempt to bring lots of color to the party. 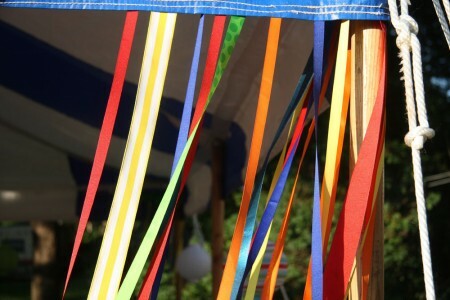 I didn’t want to spend money on flowers or balloons so I decided to make ribbon streamers for each corner of the tent. I bought a whole mess of ribbon on sale at Michael’s. I got lots of colors and patterns, along with different widths and textures. 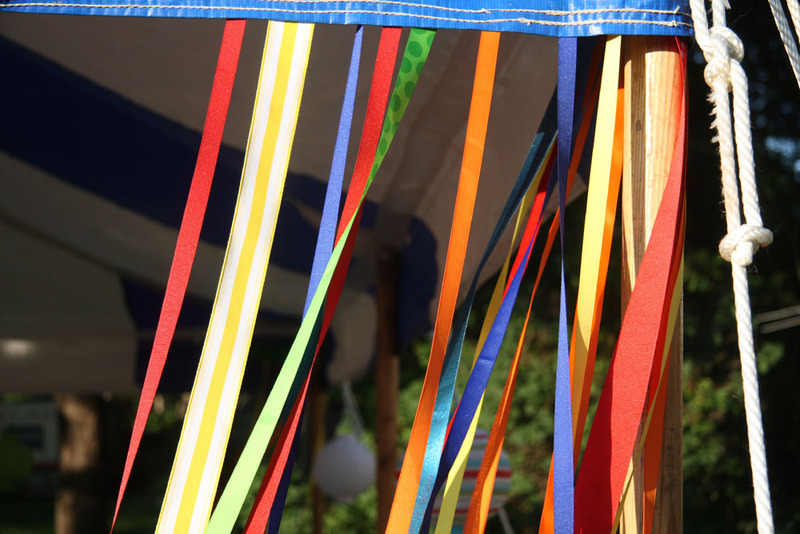 I cut them into 7′ lengths to that they would be long enough to hang from the edge of the tent to the ground. 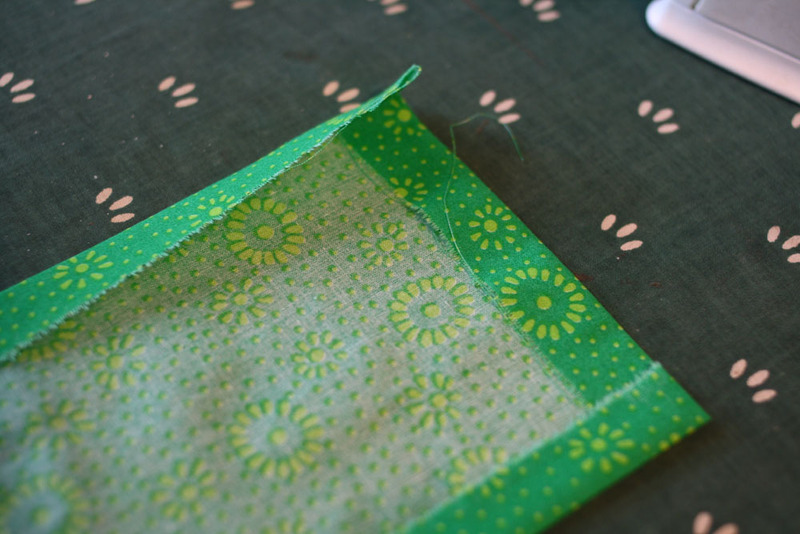 Then I routed through fabric scraps from my quilting days. I think I used one orange, one green, one red and one blue. I cut rectangles that were 24″ long by 4″ wide. I folded those in half and pressed them. I also pressed in the edges so that they wouldn’t fray. 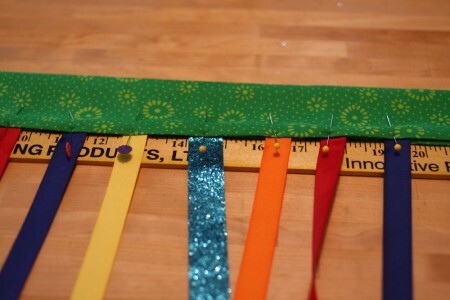 I then laid out a fabric “pocket” against a ruler and evenly placed the ribbons across the length of the fabric. I wasn’t too fussy about this part and mixed up the colors a lot. I tried to make sure each piece of fabric got at least a couple of sparkly ribbons mixed in with the satin and grosgrain ones. And I tried to mix up the colors as much as possible. 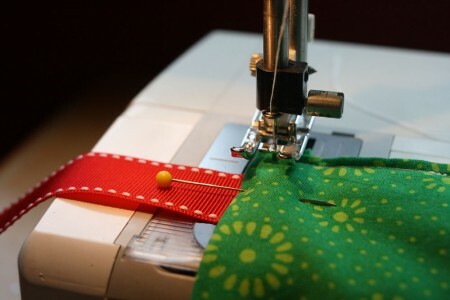 I pinned each ribbon in place and then sewed a seam along the edge of the fabric. It was, as Lois calls it, quick and dirty sewing, but it had great results. The day of the party I hung a ribbon streamer from each corner of the tent. They added color and life to what would have been just a plain tent. They danced in the wind and really looked beautiful. I think it cost about $30 for all the ribbon and the rest of the supplies were things I already had. It took me just over an hour to make all four pieces. 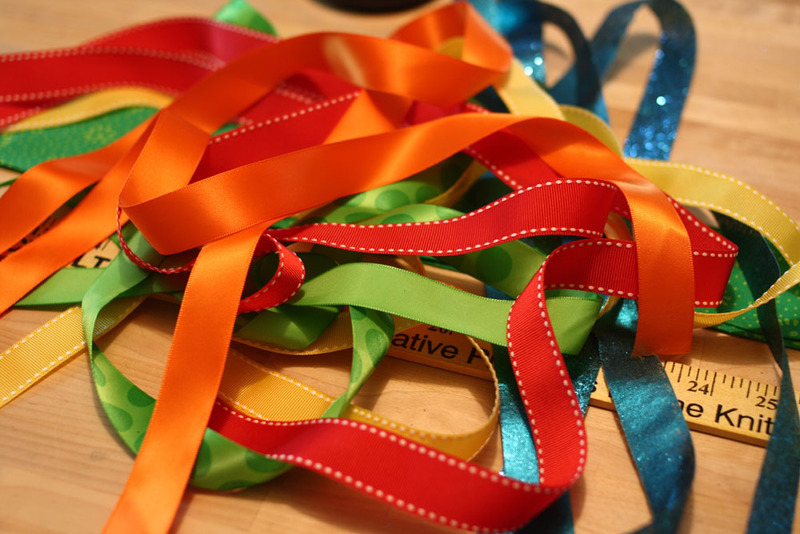 DIY Ribbon Streamers are a very good decoration. 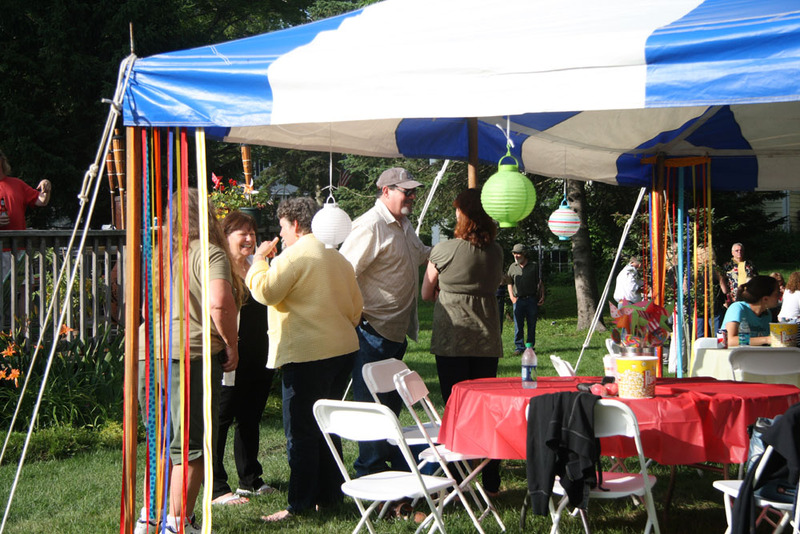 I don’t want to give too much away concerning Dale’s upcoming birthday party since some of my readers will be guests but I guess I can tell you that we are having an old-fashioned carnival in honor of the birthday boy. It’s quite appropriate for my husband since he’s truly just a big kid. 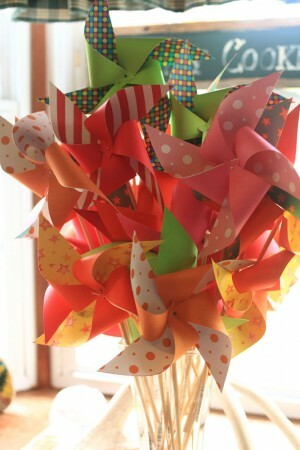 I’ve been gathering ideas for decorations and activities for months and one of the things I wanted was colorful pinwheels. I decided to make them myself and I thought you all might enjoy seeing how I did it. 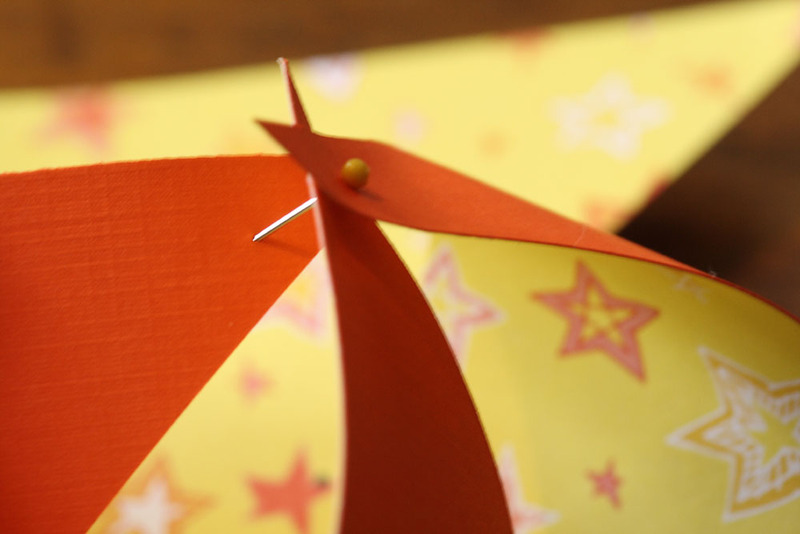 For supplies you will need 12X12 scrapbook paper in coordinating colors and patterns, wooden dowels, glass head pins in assorted colors, spray adhesive, and beads. You might also find it helpful to have a quilting mat and rotary cutter. 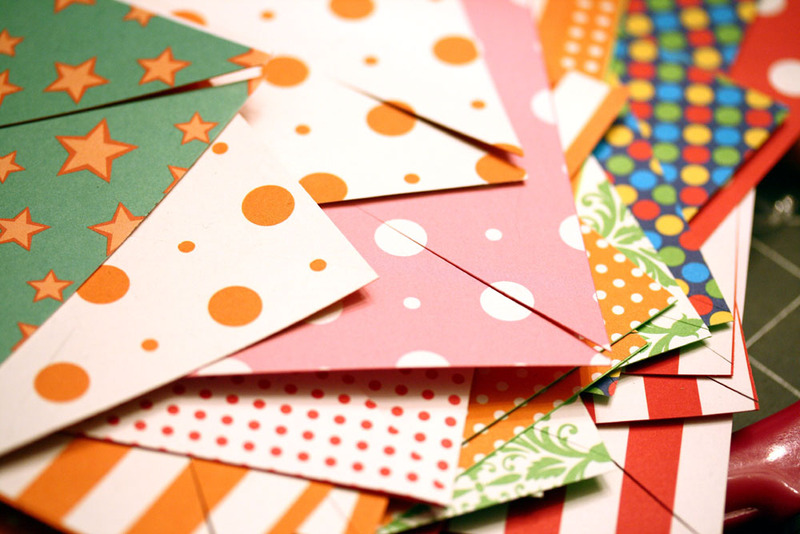 Begin by matching up your scrapbook papers – I chose one solid paper and one printed paper but you could put coordinating solids or prints together. 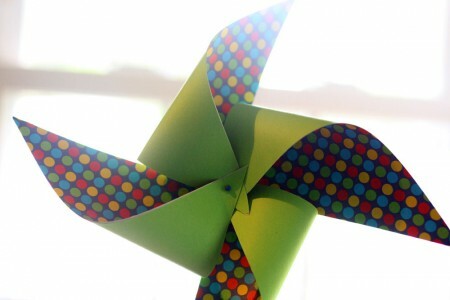 Use the spray adhesive to glue the wrong sides of the paper together and let them dry overnight. Now you need to cut those 12X12 sheets into four 6X6 squares. I used my rotary cutter and quilting mat for this but you could do it with scissors or an exacto knife. One you have all those squares cut up you need to mark the center of each square with a dot – I used a black sharpie. Make 4 more dots 1/2 inch from that center dot to make a square. You should have a total of 5 dots at this point. 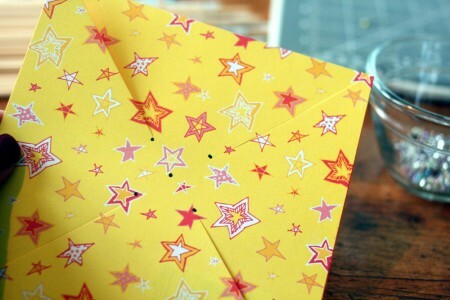 Use your rotary cutter to cut diagonally from each corner to each dot, leaving the center uncut. 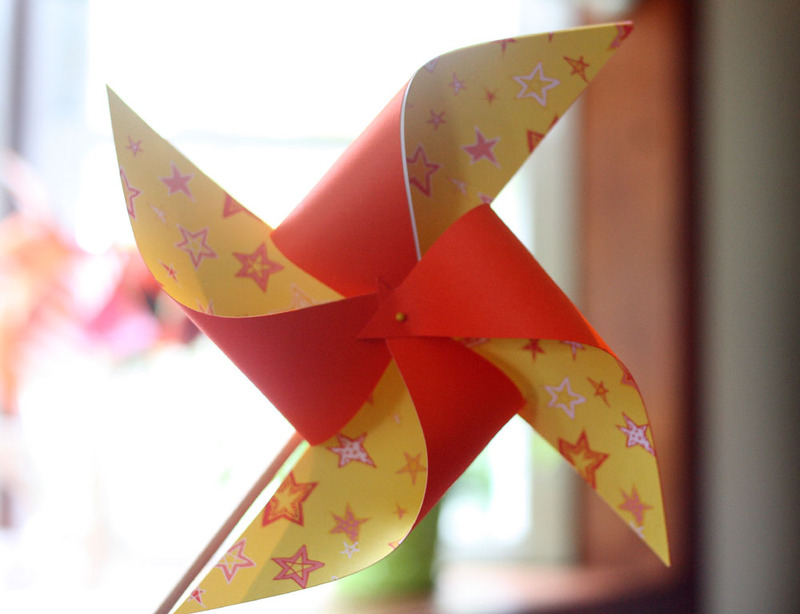 To make the pinwheel shape, gently bring one of the points to the center, being careful not to crease the paper. 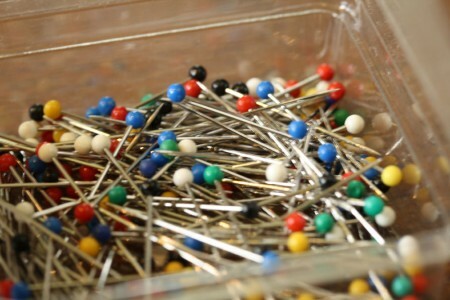 Continue around the square bringing every other point to the center and then hold them in place with a glass head pin. 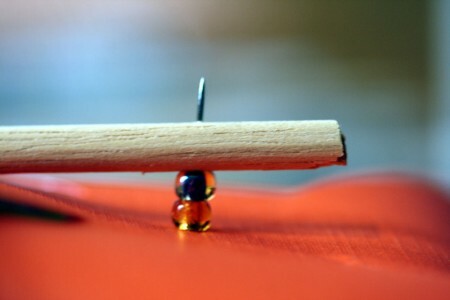 Push the pin through all four points and through the black dot you made at the center of the square. 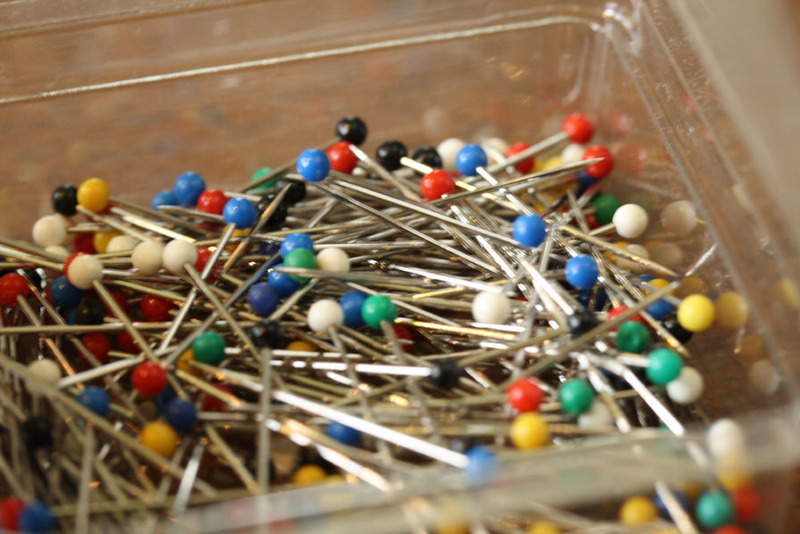 Put a bead or two, depending on the size of your beads, on the end of the pin on the backside of the pinwheel and then carefully push the pin into the end of a wooden dowel. 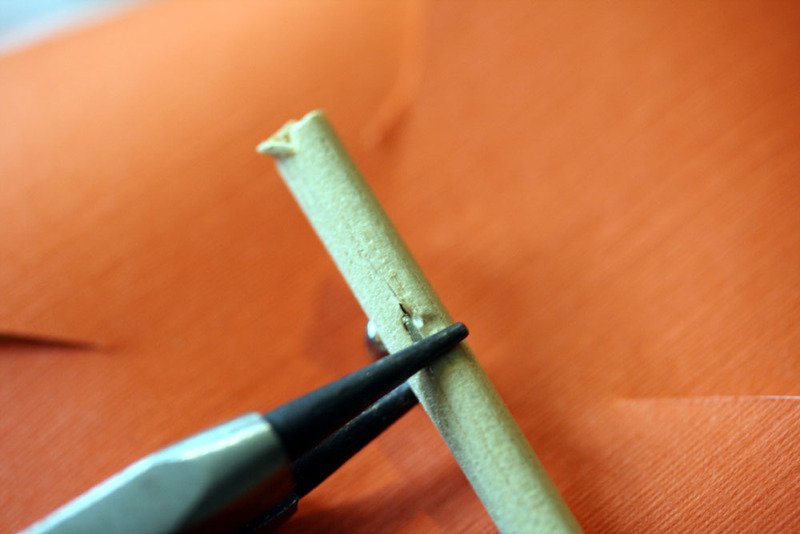 Use pliers to bend the end of the pin back into the wood to secure it in place. And there you have it – a fun, festive, and colorful pinwheel. Truthfully, not all of these spin very well. The paper is a bit heavy and I probably could have used bigger beads. I honestly don’t mind, though, because they look just the way I pictured and they will be awesome as centerpieces on the tables. 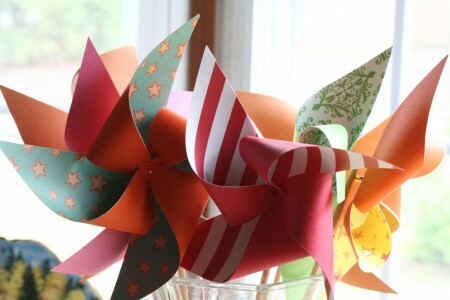 Now go forth and make your own pinwheels!